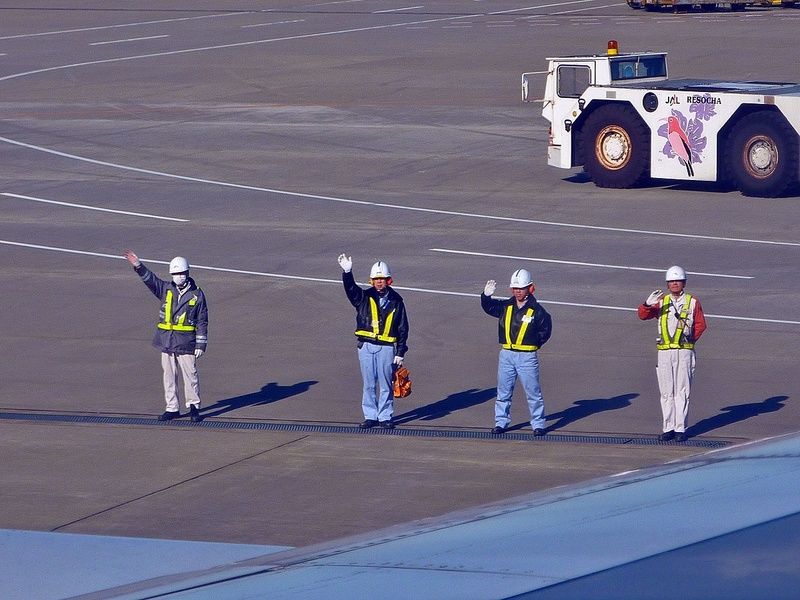 Our last image of Japan was the ground crew, standing at attention as our plane pulled away from the gate, waving goodbye in unison. It was another perfect example of the Japanese courtesy, respect and ritual we’d come to appreciate so much. It was also the last courteous behavior we’d witness that day. My household loves The Amazing Race. And there is always a team or two that seem on the verge of self-destruction because of their sharp, disrespectful talk to each other. We’ve rolled our eyes at those teams, been annoyed by them and silently hoped their demise was imminent. Well, this travel day…we became that team. Our path was Tokyo to Siem Reap via a connecting flight in Shanghai. I was elated when I found cheap flights to Cambodia — the day after booking China Eastern Airline, an article came out stating it was #2 in the world for worst on time record. So we were mentally prepared for delays and even entertained a nights sleep in the Shanghai airport. Bring it on. We kicked off the trip with a four hour delay at Narita. No problem. When we arrived in Shanghai, we raced through the airport in an effort to make our connection. There were formal stops along the way in which serious looking Chinese airport officials in military-like uniforms looked at our paperwork and grunted humorlessly at us. It was clear we were not in Japan anymore. We made it to our gate in time, sweaty but elated and quickly realized the flight to Siem Reap was also delayed. We first scoffed at the claim of bad weather but a nearby TV showed newsreel of a typhoon that had passed through and flooded the area. We settled in, still winning at mind over matter, playing UNO and judging those around us…a foursome of Russian men lumbering loudly, a pair of older European women in a huff about English language inability of the Chinese airline clerk. WE weren’t ugly travelers. Our flight took off after a four hour delay, and somewhere in the skies between Shanghai and Siem Reap, my family turned. The kids became electronic game junkies, eyes glazed over, barking at each other loudly despite much of the cabin trying to sleep. I hit my no sleep wall and clambered away from my responsibility of shushing the kids to an open bank of seats to give in to rest. Seemingly every minute a chorus of “mom, mom, mom” combined with poking fingers would wake me up with some trivial need. At some point, the cup runneth over and we all combusted…sharp tongues delivering harsh words resulting in loud tears. The two European women who we had judged earlier sat across from us now able to return the favor. We landed in a flooded Siem Reap at 2AM. There were no taxis – they could not reach the airport. The airport itself was shutting down and we were pointed to outside damp benches that could serve as beds until morning. Kyle and I tried to be philosophical about it…this experience would help harden our kids, make them tougher. Then I pulled out my iphone. I reached our guesthouse, the Golden Mango Inn, by phone and begged for help. There were no promises, the road to the airport was flooded. Almost two hours later, trying to rest next to the now sobered Russians, I heard a voice in the distance say “Golden Mango” and I was up like a shot. And that is when we met Hou. 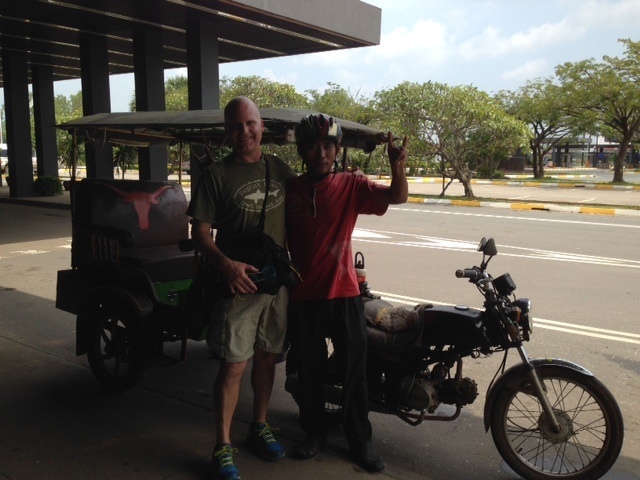 He was drenched from head to toe and he was our tuk tuk driver. We clambered in, backpacks and all, and sped off to the hotel. 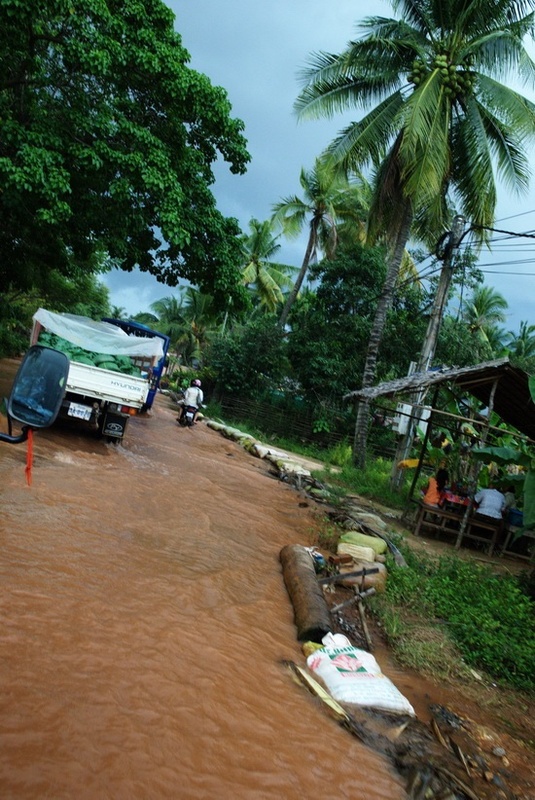 The streets were flooded and muddy water sprayed our legs and our luggage as Hou navigated the scene. Hou became not only our hero but our driver for the week. And after such a long day, I looked at my family closely. 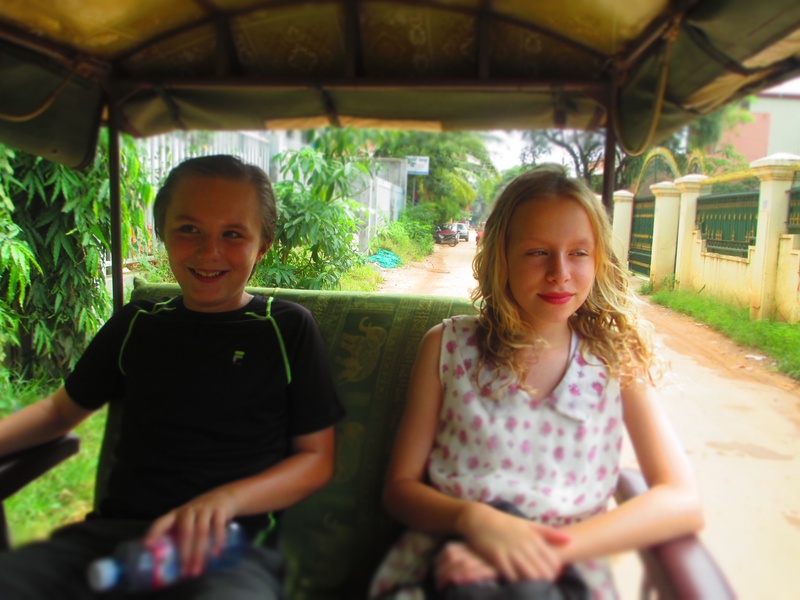 Here we were, in our first tuk tuk ride ever, rain and wind and the promise of refuge setting our spirits straight again. Everyone was smiling…our ugly travelers faded. From misery to miracle at the speed of a tuk tuk. I love your honesty to capture not only the highlights of the trip, but the moments of struggle, exhaustion and fighting. It is all part of your journey and your sharing is REAL. Linda, I so agree. It wouldn’t be speaking the truth if I didn’t share the ugly as well as the grand. Fortunately we are mostly having an amazing time! That is not true Sean was the only one yelling and crying just because his iPad died. I didn’t do a thing.